And there it is. Book Two officially begins. To anyone who did catch my relatively vague clue last week about it being a “good day to start a new story,” you cracked the code (Book One also began on Wednesday, August 15th, but that was back in 2012)! We’re picking up the action a short while after Crossing Paths ended. Some time has passed. Not much. Let’s say a year. It’s the end of summer. Scout’s settling into his new home just fine, and not only has he improved his own fetch skills, he’s taught Bigfoot how to play the game as well (as he promised he’d do in Book One). That prelude page last week where it looked like Scout was in jeopardy was just a little fun misdirection on my part. 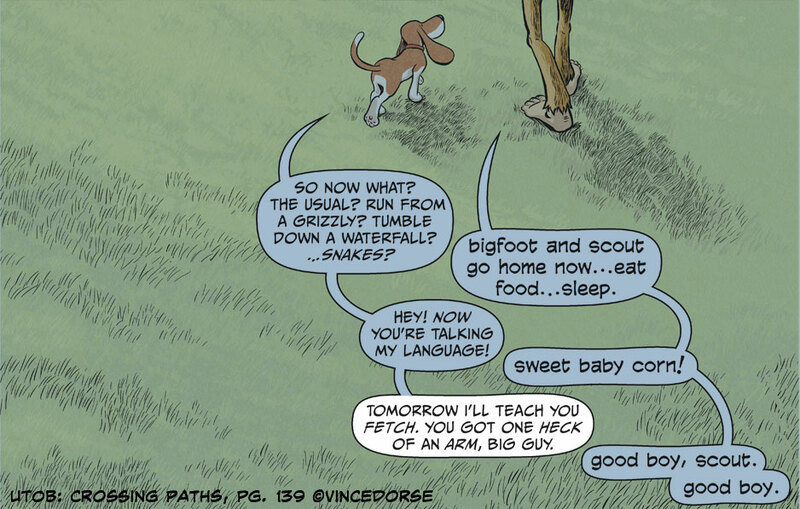 Not too much Bigfoot in this story so far, but rest assured the big guy’s enjoyed having Scout around to share the cave. 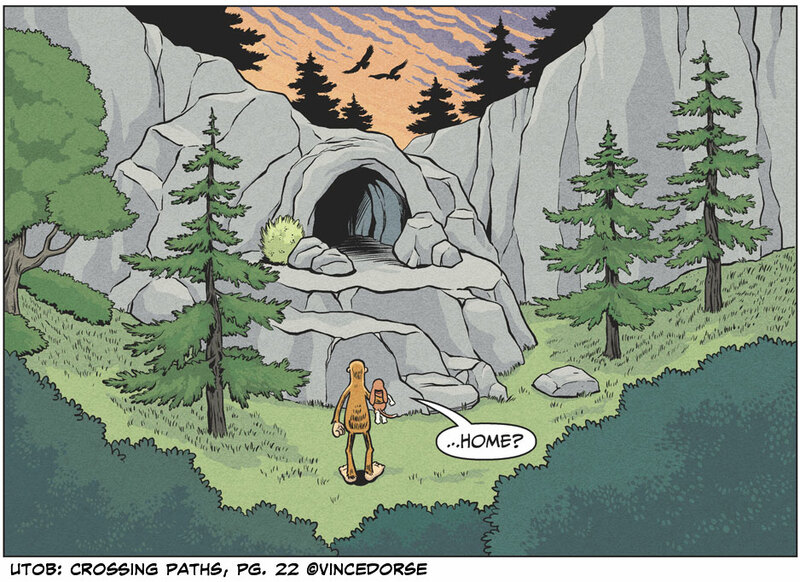 Speaking of Bigfoot’s Cave, here it is below, from page 22 of the first book. Boy, do I dislike having to draw the same thing twice. Good thing I cleverly inserted six years in between doing these two drawings. If you compare the two images you might notice that all that ‘experimenting with inks and colors’ I’ve been doing in between Book One and Book Two has resulted in just a slightly different style. Still fun, though. Fun for me and, hopefully, for you folks too. Is Book One A Must? Well, sure, my answer leans toward yes, it’s a must — buy two copies and give one to a friend! But, realistically, do you absolutely need to have read Crossing Paths to grasp what might happen in Ghosts and Monsters? I don’t think so. I hope the exposition, dialogue, and occasional flashback will guide new readers through the story smoothly. But if you have read the first book, I think you might enjoy this continuation of the story on a deeper level. Fun for me, and fun for you too. YAY! Book two! Wednesdays have more to look forward to until–end of 2019?–would be nice. Carry on.